Named for the Vermont settler family that built the original cabin, this first-floor, west-facing guest room has a king bed with four pillows and an elegant, custom-designed, natural cherry headboard. You’ll be warm snuggling in the duvet this winter. The furniture and art in this ample sized bed and breakfast room celebrate all that inspires us about the past. Relax after birding or biking in your Peshtemal cotton robe. You have a desk/table and comfortable chair and Wi-Fi. 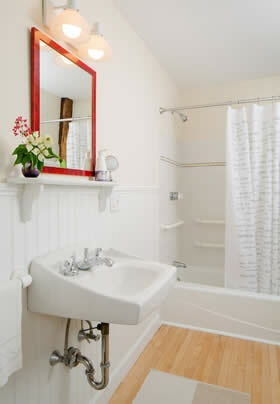 The adjoining private bath has a tub with shower. The bath is equipped with safety bars for your comfort. A small vestibule separates this room from the living room, adding to your privacy.